We haven’t seen the deeds to this house, but we know from the deeds of the adjoining property that it is very old. The earliest record of a house in this position is in a deed belonging 50 High Street dated 20th July 1689. This shows that Henry Baynham was the owner of this house. At this stage we don’t know much about Henry. The IGI records a marriage of Henry Baynham to Mary Ailworth at Oldbury on 5th December 1644 and there is a grave in St Mary’s Church in which a Henry Baynham was buried. He died on 19th May 1693. The building still displays an interesting plaque showing it was insured by the Sun Fire Assurance Company which was founded in 1710. George Motley – the deeds of number 50 show that George Motley had been owner of the property at some time before 1794. We don’t know any more about this George Motley. Thomas Raymond – was shown as the owner of the property on the deeds of number 50 on 25th February 1794 and on 8th March 1802 and 15th January 1805. We know from the land tax and rent book records that Thomas was an important person. He was the son of William Raymond of Sibland near Thornbury Esq and his wife, Mary (nee Hampton). Thomas took the name of Symons on succeeding to the Meend Estate in Herefordshire. In 1796 he inherited this Estate which had been bought by his great uncle, Richard Symons, about 1740. When Richard died the estate descended to his daughter, but when she died without children, it descended to Thomas, the grandson of Richard’s sister, Ann. Thomas married Mary Margaret Chapman and they had several children: Thomas Hampton, Richard Harcourt, Charles, Frederick-Raymond and Mary Ann Jane. Another two sons died young; William John Raymond died August 4th 1808 aged only 14 years and George Raymond died 13th September 1796 aged three months and 13 days and was buried at Kingston in Surrey. Thomas was a military man. In 1783 he was serving as Captain in 1st Battalion, Gloucester Militia when he appears to have been made a Freeman of the City of Gloucester. Two of his sons, Thomas Hampton and Richard Harcourt (then serving as Cornet in 6th Dragoon Guards) were also made Freemen. The memorial to Richard says he was formerly of the 7th Dragoon Guards and that he died suddenly aged 50 in 1850. Thomas died on the 6th November 1818 aged 74 years and was buried in the Parish Church of Much Dewchurch in Herefordshire. There is a memorial to him and the several others members of his family in Thornbury St Mary’s Church and another memorial in St David’s Church, Much Dewchurch Church. Thomas’s wife, Mary Symons, died in 1834 aged 69 and was buried in Lyme Regis. Amelia Salmon – according to the deeds of 50 High Street, Amelia Salmon is mentioned as being the occupant of the house as a tenant of Thomas Raymond on 25th February 1794, on 8th March 1802 and on 15th January 1805. The 1800 land tax also shows Mrs Salmon there as tenant of Thomas Raymond. Amelia was the daughter of Thomas Cox of Almondsbury and his wife, Elizabeth (widow of late William Clarke of Thornbury). She married John Salmon, a maltster of Thornbury, and their first child, Thomas Stokes Salmon was baptised on 13th March 1771. Amelia died aged 65 and was buried on 19th February 1806. Revd William Jones – the records of 1809 and 1810 show that the Reverend William Jones was the occupant. William was a non-conformist pastor for 14 years at the Congregational Chapel now known as the United Reformed Church. He appears to have been followed by the Reverend Benjamin Howell who is shown as tenant of 48 High Street. The 1812 land tax records show he was living there and he is listed up until 1825. He is also listed as undertaking services at the same chapel although not included in the Edgar Pitcher’s list of church ministers. William Herapath – from 1826 to 1830 William Herapath was listed as the tenant. William married Mary Phillips Gibson in Thornbury on 22nd December 1819. There were three children listed as being baptised at the Congregational Chapel: Adonijah born on 4th July 1822, Elizabeth born on 2nd October 1823 and Samuel Howell born on 3rd March 1826. The inclusion of ‘Howell’ as a middle name might suggest a family connection between the Herapaths and the church minister, the Reverend Benjamin Howell, but it might just be a mark of their respect. We know from a court notice dated 15th November 1827 that William was a hatter. At that time William’s partnership which William had with his brother, Samuel also a hatter in Thornbury, was being dissolved. Samuel had been a witness at William’s wedding in Thornbury in 1819. The 1841 census shows that the family had moved to Lambeth in London. William and Mary may have separated as he is listed at the Bridewell Hospital House of Occupations which was established to provide a home and training for deserving children. William was working as a ropemaker. Mary is living in Brook Court, Southwark with her children, Elizabeth aged 17, Samuel a wheelwright aged 15, George aged 12 and Sarah aged 8. Sarah had been born after the family moved to London. It is interesting to note that William’s brother had also moved to London. In 1829 he had been declared as insolvant whilst owning a hat manufacturer’s business. In spite of this setback, he recovered and was a hatter when in 1847 he was admitted to the Freedom of London. In 1851 William is still at the Bridewell Hospital House and Mary is living at 1 Little Canterbury Place, Lambeth with George, a carpenter and Sarah. Mary Phillips Herapath died in the Lambeth area in 1858. On 26th April 1860 William married for a second time. His wife was a widow, Jane Dunn and their marriage took place at St Marys Church, Lambeth. William died on 9th April 1875 whilst living at 99 New Kent Road, surrey. The probate record shows he was formerly living at 6 St Mary’s Square, Kennington Road, Lambeth. We don’t know who became the owner following Thomas Raymond’s death. The land tax and rent roll records show that the property was still owned by ‘Late Thomas Raymond’ so presumably it was Thomas’s trustees. The 1859 and 1862 Rate Books show that the property was owned by ‘Miss Raymond’. The James family – various records show that Richard James was initially a tenant of ‘Miss Raymond’, but by 1864 he became the owner. The 1851 census shows that Richard was living there. He was a ‘taylor’ aged 35 from Bishops Castle in Shropshire. Richard was living with his wife, Caroline, aged 33 from Thornbury and their children: Thomas aged 8 (baptised in Thornbury on 8th March 1843), John aged 7 (baptised in Thornbury on 20th March 1844), George aged 5 (baptised in Thornbury on 29th March 1846). The 1859 Rate Book shows Richard James was tenant of Miss Raymond. Richard may have married Caroline Williams in Bristol in the June quarter of 1841. He appears in the trade directories from 1856 as tailor in the High Street. The 1861 census shows the family still living there. Richard’s eldest son, Thomas had become a tailor, and there were two extra children: Edward aged 9 (born on 17th June 1851) and Phillip Gostage James aged 3 (born in 1857). Phillip died aged 7 years and was buried on 8th November 1864. The deeds belonging to 50 High Street show Richard James was the owner of 48 High Street on 2nd February 1864. The 1871 census shows them still there – now of the children just Edward was living with his parents – he had also become a tailor. The 1880 Rate Book confirms that Richard was now the owner of the property as well as the occupant. He had also acquired the ownership of 7 Pullins Green which was let out to tenants. The 1881 census describes Richard as a tailor/draper aged 65. He was living in the house with Caroline now 63 and George a schoolmaster aged 35 and Edward a tailor aged 29. The 1889 Thornbury Trade Directory lists ‘Richard James and Sons’ as tailors in the High Street. Caroline died aged 70 and was buried on 23rd July 1887. The 1891 census shows Richard is living there alone – a tailor aged 75. He died aged 76 and was buried on 30th December 1891. Following Richard’s death, the rate books show that his youngest son, Edward James, took over ownership of the property. The 1890 Rate Book shows that he was living in the house owned by Thornbury Town Trust which later became known as 58 High Street. Edward had married Mary Laura Pointing in the Bridgewater area in 1888. Mary Laura was born in 1852 in Wickwar, the daughter of Thomas Pointing. Edward and Mary Laura had two daughters, Laura baptised on 15th January 1890 and Susan baptised in Thornbury on 27th May 1891. Edward and Laura were living at 58 High Street in the 1891 and 1901 censuses. Initially Edward let out 48 High Street to tenants: Edward Charles Ellis was listed as the occupant in the 1894 rate book and Charles Eddington was the occupant in the 1899 rate book. In the 1905 Rate Book the property was shown as being unoccupied, but the 1910 and 1926 Rate Books show Edward James as the occupant as well as the owner. Edward was listed in all the trade directories of this period as being a tailor in the High Street. The 1911 census shows Edward and Mary living in the house with their two daughters. Mary Laura died aged 62 in 1914. Edward was still being listed as a tailor living in the High Street in the 1914, 1915 and 1916 Prewett’s Street Directories. Edward died in 22nd March 1927 aged 75 and according to the newspaper report of his death he had only given up work a few days earlier. Hector Gill – Hector Gill is mentioned in the deeds of number 50 High Street as being the owner of number 48 in 1932. We don’t know for how long Hector and his family there. He is listed in the electoral register as living in the High Street for many years from 1931 onwards, but we know from the special register compiled in 1939 in preparation for the war that Hector and Alice lived with Alice’s parents in Westminster House, 56 High Street. The special register shows that the property at 48 High Street was let out as two unfurnished apartments, one let to two single ladies, Lydia Hayden, a school teacher born on 20th October 1913 and the other to Edith Williams, a boarding house keeper born on 17th May 1884. Hector was born in 1894, the son of Alfred Gill, a railway engine driver and his wife, Sarah Ann (nee Stevens). Within a few years of Hector’s birth, the family moved from 21 St John Street to Jubilee House on Gillingstool Hill. Hector as can be seen below had a large number of interests and jobs in the church and the community. The first of these that we have found so far is that in 1910 he was given the job of organ blower at what later became known as the United Reformed Church. For this he was paid £2.00 a year. In 1918 Hector married Alice May Cripps in Tuffley Church, Gloucester. Alice was born in 1896, the daughter of Mr & Mrs W. J. Cripps, of Dunsbourne House, Reservoir Road. 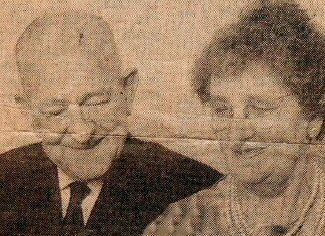 We are very grateful to Carolyn Figg for sending us a copy of the newspaper article at the time of their Golden Wedding. This told us a lot about Hector and Alice. As a young lad Hector was an apprentice tailor, but in 1914 he was one of the first to volunteer in the First World War. Hector joined the Royal Army Medical Corps and served until 1919. He saw active duty in France and the Balkans and was invalided home following a bout of malaria in Salonika. The article says that Hector met Alice on a Monday and they were married a few days later on the Wednesday, 29th May 1918. After the War, Hector had temporary jobs with the Labour Exchange and Pearl Assurance Company. In 1927 he started work as a rate collector with Thornbury District Rural Council, a post he held for 30 years until his retirement in 1958. In addition to his normal duties Hector was also responsible for maintaining the electoral registers until he retired. Hector was also busy with other interests: he played football for Tytherington, played cornet in the Thornbury Baptist Brass Band and in the 1930’s he was Group Scoutmaster for Thornbury Scouts. He was one of the founder members of the Thornbury Branch of the British Legion and served on the original committee and was branch secretary for a number of years. He took a leading in the setting up of the Women’s Section. During the Second World War he served as a Corporal in the Home Guard. Alice was also involved in various activities. At Gloucester she had been a member of the Girls Friendly Society. Her fine soprano voice meant that she was in demand at concerts and she deputised for her sister as organist at church. In Thornbury she was a member of the women’s Section of the British Legion, acting as their treasurer for about 10 years and was a member of their social committee. She was a Sunday school teacher at the Church Institute. During the Second World War she helped out with the YMCA which was run at the Congregation Church schoolroom for members of the forces stationed in or near Thornbury. She was also secretary of the Old Time Dancing Group. Hector was known locally by the family as ‘Peck’. They had three sons: William Alfred born in Wheatenhurst area in 18th December 1923, Douglas Henry born in Thornbury on 3rd October 1928 and Anthony John Michael born on 27th December 1931. The 1939 register shows that Hector and Alice Gill lived in Westminster House with their son William and two lodgers William Cripps and Catherine Giles. The 1946 electoral register continues to confirm that they lived in Westminster House. In 1950 the electoral register says only that they lived in the High Street, but the 1954 and 1958 electoral registers place them clearly in 48 High Street. William Cripps was the father of Alice. William was born in Llantrisant in South Wales. William Cripps was a market gardener and he lived in Dunsbourn near the Robinswood Hill reservoir in the Tuffley area of Gloucester. His wife Sarah Jane bought Westminster House in 1934. Read more about Sarah Jane and William Cripps. Hector and Alice are not listed in the Thornbury 1961 electoral register so we don’t know where they were living then. The 1965 electoral register shows Hector and Alice had moved to 6 Pullins Green, near to where their son, William was living with his family at 19 Pullins Green. The article at the time of their Golding Wedding shows they had moved to Weston Super Mare for a year but returned to live at 42 Hamble Close, Thornbury. The 1975 electoral register shows they had moved into a flat at 5 Castle Street. Hector died in 1978 in Thornbury. In more recent times, the property has been used for commercial uses. Lloyds Bank were there in the 1960’s before their move to 5 High Street in the late 70’s. The 1965 and 1970 electoral registers lists Leslie S. and and Dorothy A Burcombe were living there. Presumably they were employees of the bank. In 1995 a business under the name of Martin Hale traded there. The property is now the offices of Morgan Stone, a group of independent financial advisors who took over in 1998 from Hale & co, an insurance company. The current owners are Geoff and Christine Healey who lived in Thornbury but now live elsewhere.